Thrill seekers and spectators can experience a new event later this month, as 32 of the world’s best hydroflight athletes will take part in a two-day competition in Hamilton Harbour during “Battle on the Rock” on August 25th and 26th. “Bringing you awesome aerial tricks up to 60ft above the water, riders will fight for their positions on day one at the Qualifying Battle Rounds,” the organisers said. “Friday evening will feature an LED Jet Pack Invasion showcase and RockFire Productions flaming presentation all in the event village on Front Street. Day two; the high-flying competitors leave it all in Hamilton Harbour for the Competition Battle Rounds, with freestyle rounds and never seen before Hydroflight head to head face-off rounds. Savvy Entertainment is about introducing new, interesting and dynamic events to Bermuda says CEO Anthony Blakey who said, “When the proposal was brought to us to introduce the island to its first international Hydroflight competition, it was a no-brainer, and just like that, Battle on the Rock was born”. “Hydroflight, like any extreme sport, takes hard work, dedication, and skill,” says Callon Burns, Battle on the Rock’s only Bermudian Competitor. “The sport is still new, and many people still don’t even know what it is. I am happy to be a part of introducing Hydroflight competitions; a sport that I love to Bermuda, the island I love. 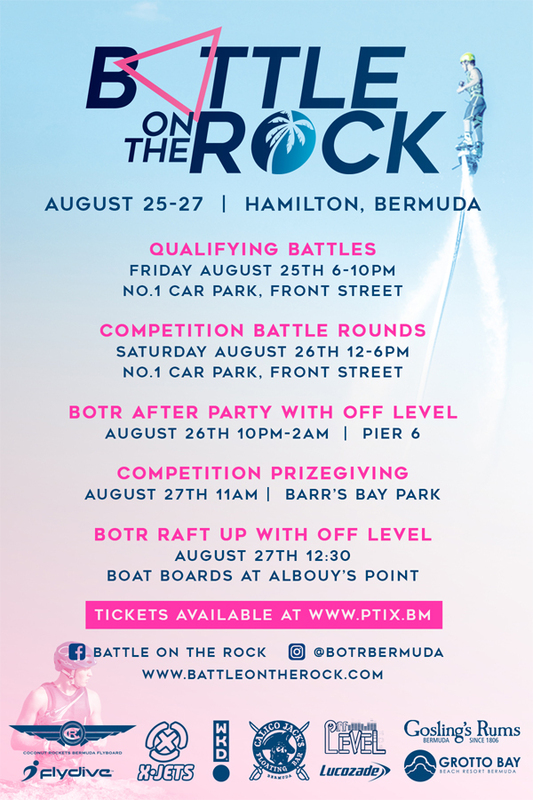 I am proud to be the only rider representing Bermuda in Battle on the Rock”. The organisers added, “Battle on the Rock is for the public of all ages to come out and enjoy this inaugural experience. The Battle on the Rock Event Village is on Front Street in #1 Car Park and will host dining vendors, snacks, a children’s area with interactive extreme games and VIP seating options. “There will be entertainment and also an electronic scoreboard so that you can keep track of your favorite riders! Bring your flags, your chairs and enjoy all that Front Street will offer as you witness the most amazing water stunts from some of the world champions in the sport. This looks like fun. Wow and something new to the island! Count m in !